This immense bouquet is the ultimate gift if you really want to tell somebody you not only love them but adore them incredibly so. With 48 premium long stem deep Red Roses, you cannot make a bigger impression on Valentines Day or any other day. Vase not included however, to personalize your gift, you are able to add one. 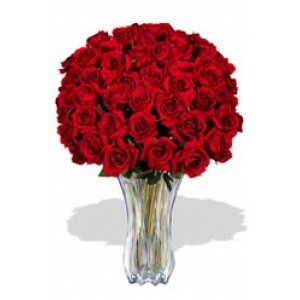 For 48 roses, we recommend a Superior Vase to leave a lasting impression. Roses available in Pink, Yellow, Orange & White.